Discussion in '[H]ot|DEALS' started by nicklemarr, Mar 19, 2019. Or for $11 more one with Wraith cooler. $58.99 is the price for anyone else who assumed the 125 watt portion was the price and couldn't figure out why the deal was hot. ReaperX22, Mav451, FNtastic and 9 others like this. I still use the FX chips, just don't see the point in dropping new money into old tech outside of a cheap Minecraft rig. Thanks. I might find this useful. I'm still running my original FX 4100 at work now (used to be my home system before I went with a Ryzen 5 2600X), and the NIC on the motherboard is tied to a piece of instrumentation. I'll have to see if my board can take it, though. I have an FX6300 + 1080ti at home clocked to 4ghz with power savings disabled. It always impresses me how snappy it is and games play fine fortnite is getting around 100fps in battle royale mode 180+ in creative on ultra settings. I literally see 0 difference between it and my 3.7ghz ryzen 1700 rig for gaming. That's a pretty good price. I snagged one recently for $100 cdn to give my old phenom 2 system a bit of a boost. I've got it paired with an evo 212 fan so it stays pretty cool and quiet. This would be a great drop in upgrade for my PII X4 975 media server. Good find OP! This is a good deal.. I'm using an overclocked FX 8320 @ 4.6ghz in my work (programming) pc with a sapphire 290... At the OS level its still flawlessly quick, a bit ahead of a 3770(non k) in cinebench multi-core. Honestly can't feel a difference between this and a 2700x for general use. I also game on it quite a bit, it's decent enough to keep most (*cough* not far cry 5) games at 60FPS, but naturally not ideal for a brand new build.. These are also immune to Spoiler, right? Seems pricey. I have an 8320e system with 32gb ram that is collecting dust that I need to part out and put on the FS thread. I was going to ask $250 for cpu/ram/mobo... so $125 just for the chip seems high. edit - OH I see, $59, not $125. Yeah that is a much better deal. Wow, they actually have some AM3+ motherboards in stock too, that is shocking. Asrock 880GM-LE FX, it sho does, I already had one in it before. Plus I Handbrake on it 12hrs a day so the extra threads will help me big time. And you can probably find someone in FS/FT to buy your P2 chip for $25, making it even cheaper! picked this combo up for $60 almost 2 years ago, cpu came in the tin box. You got a sweet deal for $60! Ya. 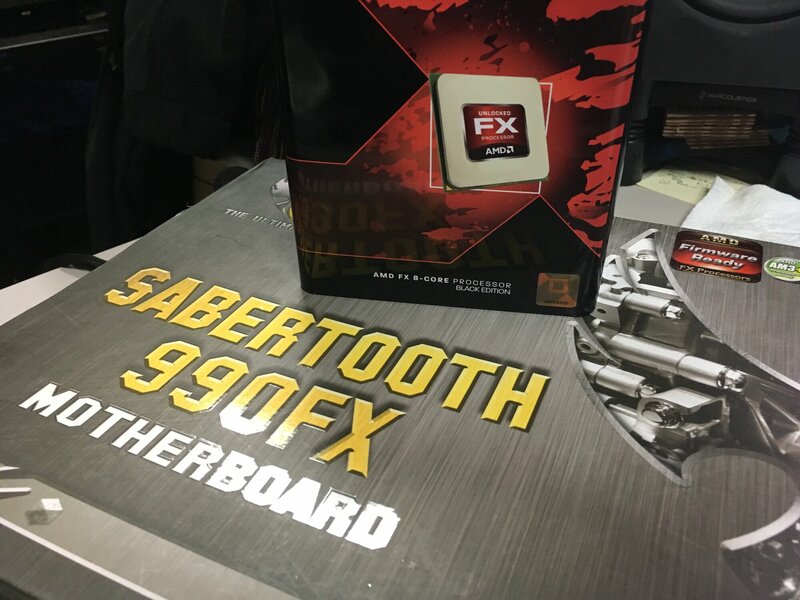 I actually sold the board to a member here a few months ago that was needing a 990fx board. I happened to have an old Asrock board that supported the 8 core CPU so that is what I am using now in my media server. Careful going the am3 route. I picked up some good scores a few months back, but struggled to find a mother board that would work for my needs. I'm happy with my am3+ setups now, but will not invest anymore money into them going forward. God no. People need to stop buying that crap. Get a Ryzen 2200G if you must. That would be nice but then you have to factor in the cost of a board and ram. Not really worthwhile for my work machine or my nephew's Fortnite addiction machine or my brothers Fruity Loops and netflix machine..
$60 and an easy OC to 4.6ghz gave me comparable performance so why not. deruberhanyok and CAD4466HK like this. Nothing wrong with this if trying to extend the life of an AM3 rig.. If budgets are tight, then splurging for DDR4 / AM4 board is most likely not going to be in consideration. CAD4466HK, Burticus and deruberhanyok like this. As a secondary machine, this was a nice little boost without spending too much. I was thinking about replacing my Phenom 2 for a couple years then I finally ran into a game that flat out rejected it. Far Cry 5 will not on Phenom CPUs. It will just spit out an error telling you your system doesn't meet the requirements. While not a huge deal, it got in the way of cooping the game with my wife. I got mine for $100 cdn. Burticus and deruberhanyok like this. I just upgraded from a 8350 last year, it wasn't a great CPU when I bought it in 2014. If your gaming budget is that low you might as well buy a console. Or at least get a AM4 board and CPU. Not to derail the thread, but I’d be interested in seeing your results after you complete this test. I’ve got an 8350 combo here on my shelf I’ve been thinking about firing up for old times sake. Just a little disclaimer before I end up facing ridicule: Hopefully you've interpreted my posts the way I meant. My 'theory' is no difference in ''feel' in general purpose use (browsing, videos, etc) per my first post in this thread. Obviously a fresh ryzen is going to crush FX in single core and produce much higher frame rates in games. That's been known and obvious and a sandy bridge era CPU is going to outperform it. Added benefit with a good air cooler and a fan over the socket 4.6-4.8ghz isn't a big deal for the FX to squeeze out every last drop. Sounds crazy, but the rig I've been using the most lately is my 8350 and a GTX760. Its like '14 called and wants its mid range setup back, however as a bed room PC for streaming, and gaming its been solid for me. I'm dual booting it with Centos as a chumpy development machine and it works really well for me. At the end of the day, regardless of the cpu.. as long as the rig plays the games you like to play at the resolution you like, or it runs the work loads you run in an acceptable manner, it still a solid setup. This next statement maybe unpopular.. but if your work loads are not CPU bound.. You have zero reason to upgrade your CPU. Nebulous, Gamerdad and nicklemarr like this.